The known world's most disturbingly unpredictable settlement. A large, howling structure of ungraspable geometries, it mysteriously moves to a different milestone with each turn of the celestial clock. 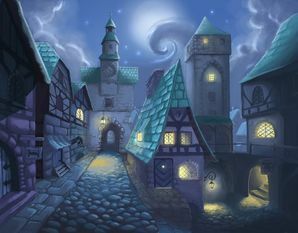 It is the legendary town that comes to you, instead of you traveling to it. It is, indeed, the one that knocks on your door and asks you to buy its ill-found loot and drink at its tavern. A special town that changes its properties and location daily, due to the ineffable caprices of the Heisenburg Uncertainty Principle. It has been rumored, though the origin of this story is unconfirmed, that the town is in fact The Great Random's corporeal form - serving as a mobile trade hub for travelers and Heroes to stock up in and help curry favor with its belief. However, because of its knack for moving from one place to the other it is near impossible to grasp its true nature. Possibly founded on 3034 g.e.. We can't be certain.